The Addictions Model Elements of the addiction model which are found in animal hoarding cases include: preoccupation with the addiction; denial about the addiction and its effects; isolation; claims of persecution; excuses for the behavior; and self-neglect. The Obsessive Compulsive Disorder Model This model may be used because hoarding of inanimate objects is a primary symptom for many who suffer with OCD, and many animal hoarders are found to have hoarded inanimate objects as well, according to a 2002 study published in Health and Social Work. In a similar study (Lockwood, 1994) researchers state that people with this syndrome appear to experience an overwhelming sense of responsibility for preventing harm to animals, and they engage in unrealistic steps to fulfill this responsibility. Focal Delusional Disorder Model Focal delusional disorder involves a belief system which is out of touch with reality. It could be present in some animal hoarders when there are claims that the animals are well cared for in the face of compelling evidence to the contrary, and may accompany paranoia about officials who are actually trying to help both the hoarder and the animals. Attachment Disorder Model This model is sometimes used to explain why some animal hoarders prefer relationships with animals rather than other human beings. They see the animals as safer and less threatening than people. 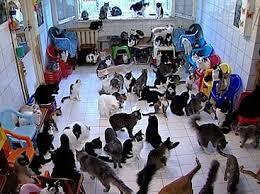 Some animal hoarders who grew up in chaotic households may have seen the animals in their lives as the only stable feature. Household factors that may contribute to animal hoarding involve dependent family members, children and the elderly or infirm who are dependent on the animal hoarder and thus reluctant to report the problem or seek help. 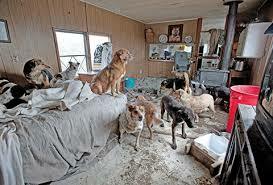 Landlords who are aware of the growing animal population may evict the hoarder to protect their property but fail to notify the Humane Society or law enforcement. In this instance, the hoarder moves the menagerie to a new location and continues the hoarding. In some case landlords have impassively given up on their property and thus allowed the hoarding to continue unabated. Community factors that contribute to animal hoarding range from the inaction of people in the community to the enacting of vague legislation. Friends, neighbors and relatives are often the first people to see the signs of animal hoarding before it becomes tragic, however they also may have little information about animal hoarding and thus not fully recognize what they are facing or know what to do about it. Service providers find themselves in the same position when they enter the house of an animal hoarder but fail to contact the Humane Society when they see animals living in crammed quarters with feces encrusted floors and no visible signs of food or water. 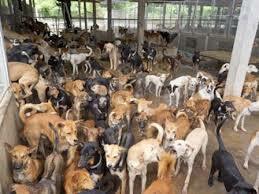 This is why increasing public awareness is so critical in addressing the problem of animal hoarding. Legislation to give law enforcement and health departments the muscle needed to take action in suspected cases of animal hoarding is also needed. Some counties have very vague laws which allow for owning an unlimited number pets as long as they are reasonably cared for. The problem is that officials are not allowed access to the inside of the house to determine if animals are cared for, and must demonstrate probable cause to get a search warrant. It sounds reasonable until you hear about an animal hoarding case where over 300 dogs were packed into a tiny two-bedroom house. If the county had laws requiring a shelter license for anyone owning more than ten pets, the owners would have to allow inspection of the home on a periodic basis to check on the welfare of the animals. Communities contribute to animal hoarding when people want to get rid of their pets but feel guilty about taking them to a shelter where they may be euthanized. Instead, without much investigation, they drop their unwanted pets off with the neighborhood ‘cat lady’ who will refuse no animal in need. Many people will not take the time to find out if she can actually handle another animal and unknowingly contribute the problem. The Overwhelmed Caregiver These hoarders initially provide adequate care for their animals which they have a strong attachment to; understand that a problem has gradually developed though they may minimize it; may be socially isolated; believe it is caused by some change in their circumstances; have fewer issues with authority figures and accepting intervention. The Rescuer Hoarder These hoarders develop a compulsion based on a strong need to rescue animals from possible death or euthanasia; actively acquired animals and believes they are the only ones who can adequately care for them, find it hard to refuse any new animals, may work within a network of animal welfare people; avoids authorities. ​Exploiters Hoarders These hoarders acquire animals to serve their own needs and are indifferent to the harm caused to them; deny the problem and reject authority figures or outside help; believe they know best and have an extreme need to control; may come across as charming, articulate, manipulative and cunning; skilled at presenting excuses and explanations for their circumstances; self-concerned and expressing no remorse or guilt; acquires animals actively; plans to evade the law, will lie cheat and steal without remorse in order to achieve their goals. ​Some hoarders will not fit neatly into one category or another but instead exhibit characteristics of several categories. Others may be incipient hoarders who exhibit some ability to care for their animals, are aware that a problem is developing but show deteriorating circumstances. While others still, the breeder-hoarder, will initial breed animals for sale become overwhelmed with the volume and care needed and may not fully recognize how the conditions have deteriorated and how it affects the animals. Regardless of our involvement with dogs - as pet owners, breed fanciers, dog sports competitors, trainers, rescuers - there is one thing we all have in common: there are going to be times when our dogs don't respond quite how we'd like or expect. It can be embarrassing, frustrating, and disappointing! 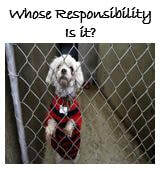 Whose Responsibility is it to make sure that the dog you are adopting is right for your family? ​We investigate the cars we buy before paying, why do we not do this with the dogs we bring into our families? In order for us to develop appropriate and successful strategies to help dogs and their owners/carers it may be more beneficial for us to look at behaviour in a different way. Not many dogs remain in one state all of the time.